On Tuesday as many as 1.4 million felons who have served all terms of their sentences will get the right to register to vote in Florida thanks to voters approval in November of Amendment 4, a day that felons’ voter rights champion Desmond Meadesaid would be historic and a celebration. “Tomorrow when returning citizens across the state will be going to their local supervisors of elections to register to vote, what we’ll be seeing is a celebration of democracy, what we’re seeing is a celebration of love,” Meade said Monday in Orlando. Gov.-elect Ron DeSantishas said he would like the restoration process delayed until the Legislative Session weighs in. 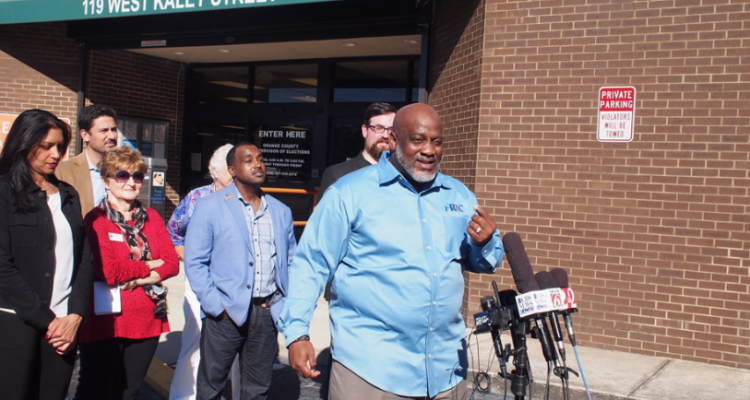 But that should have no affect on what happens Tuesday when the people Meade referred to as “returning citizens” get the legal right to register to vote, Meade and other advocates said Monday. Throughout the state,county superisors of elections have indicated they are prepared to accept the registrations Tuesday, as the law requires. “Tomorrow is a regular day, and tomorrow we are regular people,” said Meade, himself a felon who will have his voter rights restored Tuesday. “Anybody, any citizen who is eligible to vote and has a desire to register to vote can walk into any Supervisor of Elections office in their respective county and register. “That’s what we’re going to do. No one is going to ask us, ‘Well, are you a felon, coming to register?’ No! We’ll come in to register as anybody else. Supervisors of Election will be doing business as usual,” Meade added. 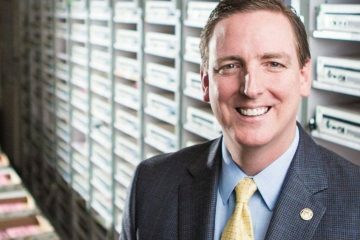 Where the challenge might come is through the office of DeSantis’s pick for the next secretary of state, Seminole County Supervisor of Elections Mike Ertel,as they do routine, rquired reviews the packets on newly registered voters arriving from throughout the state, to determine if they are eligible. At that point, they could be kicked back to the local supervisors’ offices. 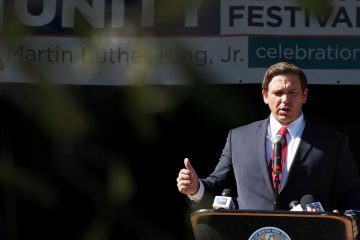 DeSantis has said he intends to honor the amendment and the rights restoration but wants a pause until the Legislature can clarify some issues. Meade and his group insist there is nothing to clarify. They can register to vote, and that’s going to start happening Tuesday. Meade also said his group and others have a “cadre of lawyers” ready to assist anyone whose voter registration status is challenged. Meade said he expects to cry when he registers. Others at Monday’s press conference expressed similar emotions. “We’re going to have a group of us in Lee County down in Fort Myers, we’re going to have breakfast. We’re going to do some crying. We’re going to do some hugging. We’re going to do some laughing. We’re gong to pray together. We’re all going to walk down to the Supervisor of Elections Office to celebrate this expansion of democracy on a very personal, meaningful level,” said Neil Volz, political director for the Florida Restoration of Rights Coalition. 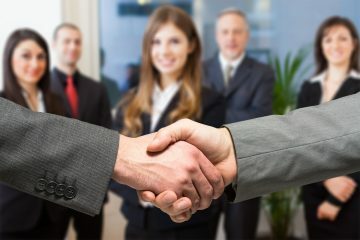 “We’re encouraging people to understand and think this through from the perspective of the millions of us who are impacted by these changes,” Volz added.